The human spine is divided into three sections, based on the anatomy and function of spinal vertebrae. The upper seven vertebrae are known as the cervical spine and make up the neck region, which supports the base of the skull. The middle portion, or thoracic spine, comprises the twelve rib-forming vertebrae, which house many of the important internal organs of the chest. The lowest part of the spine consists of the five lumbar vertebrae. Each of the 24 vertebrae are labelled based on the section of the back in which they are located, and their position within that section. The seven cervical vertebrae are thus named C1-C7, with C1 being uppermost, the twelve thoracic vertebrae are T1-T12, and the five lumbar vertebrae take the labels L1-L5. Spinal vertebrae become progressively larger and heavier from top to bottom as a consequence of how much weight they have to bear. The lumbar vertebrae are therefore the largest and strongest bones in the spinal skeleton. 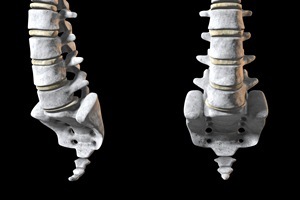 The intervertebral discs (rings of tissue that act as shock absorbers for the spine as well as allowing movement) are also correspondingly large. Directly beneath the lumbar spine, five vertebrae fuse to form the sacral bone, or sacrum. These are labelled in similar convention to the remainder of the spine as S1-S5. The sacrum supports the much larger pelvic bone, and the hip joints are located on either side of the sacral vertebrae. Because of its position, it is the link between the upper torso and lower limbs of the body. The sacrum forms a wedge shape that decreases in width from top to bottom and, just as there are gender-based differences in pelvic skeletal anatomy, so the female sacrum is shorter and wider than is found in male subjects. The front of the sacrum is marked by five transverse (horizontal) lines, which delineate the boundaries between the five vertebrae. To the rear is a ridge of bone called the median sacral crest, which runs vertically down the center of the back of the sacrum. This is the result of the fusion of the transverse processes of the sacral vertebrae. Fusion of the sacral bones typically starts to occur at some point in the late teens and is usually completed by age 30. The lowest end of the spine is completed by a structure known as the coccyx, or tailbone. This is a small bone shaped like an upside-down triangle, which is formed by the fusion of the four coccygeal vertebrae (Co1-Co4) during the third decade of life. In females the coccyx points to the rear, in males to the front. Frozen shoulder (more formally known as adhesive capsulitis) occurs when the tissue of the joint capsule in your shoulder swells and thickens, causing pain and a reduction in range of movement. It can occur in one or both shoulders, or sometimes even move between one and the other. The cause of frozen shoulder is not exactly known, but there are a number of risk factors that can lead to this problem and a wide range of treatment options, depending upon the severity of the disorder. Though frozen shoulder can occur for no seemingly apparent reason, those who have had a recent injury or whose shoulder has been in a period of immobility seem to have the highest incidence of adhesive capsulitis, perhaps because of the shoulder capsule tightening due to insufficient use. It is uncommon in men and a rare condition for those under age 40; seventy percent of all cases appear in women between ages 40 and 60. Certain systemic diseases also seem to predispose some individuals toward developing frozen shoulder. For instance, those with diabetes have a five times greater likelihood of encountering this disorder. Other risk factors include heart disease, rheumatoid arthritis, Parkinson’s disease, hyperthyroid (overactive thyroid), hypothyroid (underactive thyroid) and lung disease. The severity of your pain and stiffness, in addition to the length of time you have had the problem, will determine the most appropriate treatment options. The goal is to reduce pain and improve range of motion as much as possible, which can take an average of anywhere from 6 to 24 months. Treatment options sometimes include exercise, chiropractic care, physical therapy, drugs and surgery. If the pain is not too severe, regular, gentle exercise to help stretch the joint capsule (while being sure not to overdo it) may be recommended. Pain relievers such as acetaminophen or anti-inflammatory NSAIDs may allow you to keep up some level of movement in the joint and to relieve discomfort. Corticosteroid injections are sometimes used in cases of severe pain to reduce pain and inflammation, though it is not advised that they be used as a long-term treatment, as they can damage the joint capsule. In severe cases, surgery is sometimes indicated, though this is rarely necessary. Arthroscopic capsular release surgery is used to remove bands of scar tissue that have formed in the capsule, allowing for improved mobility in the shoulder. Chiropractic Care at Sheldon Road Chiropractic & Massage Therapy for frozen shoulder is one of the most effective and least invasive forms of treatment. Your chiropractor can recommend a course of physical therapy that can reduce stiffness and increase range of motion in the joint without damaging it in the process. Many times Dr. Kollias or Dr. Karen will reccommend Massage Therapy, ultrasound, physical therapy modalities, chiropractic adjustments and MLS Laser Therapy with the M6 Laser to treat the frozen shoulder. Interferential Electric Muscle Stimulation therapy is used in the clinic to faciliate healing by reducing pain and inflammation to the area. (For more information on Interferential Electric Muscle Stimulation click here). Often times, chiropractors recommend using Transcutaneous Electrical Nerve Stimulation (TENS) as a take home therapy to reduce pain. A TENS machine sends out small electrical impulses though electrodes attached to the skin that help block pain signals and stimulate the body to release natural pain-relieving endorphins. In addition, regular chiropractic adjustments can keep the spine in alignment and thus reduce possible nerve irritation that may contribute to frozen shoulder. To determine the best way to treat your frozen shoulder give Sheldon Road Chiropractic & Massage Therapy a call to schedule an appointment and we will do our best to help you feel great again! Our free 1 hour massage drawing is back by popular demand! As some of you may recall, Dr. Kollias has previously offered a one hour massage to one randomly selected participant who has clicked the "Like" button on our Sheldon Road Chiropractic & Massage Therapy page through Facebook. Our office is very pleased to announce we will be starting this monthly drawing again! The next drawing will take place the following Monday, August 31st, in the evening. The lucky winner can select a one hour massage with the therapist of their choice. Again, all you need to do to qualify is "Like" us on our Facebook page here and a winner will be randomly selected each time. Tell your friends, tell your family, tell your co-workers how simple it is to enter! If you have already liked our Facebook page you will automatically be eligible for our future drawings. Thank you for your participation and good luck! Author's Note: No chocolate bars were harmed during the writing of this article. Recent reports in prestigious scientific journals have been viewed by chocophiles (lovers of chocolate) as the best health and nutrition news they've heard in years. According to the research, dark chocolate may actually be good for you. 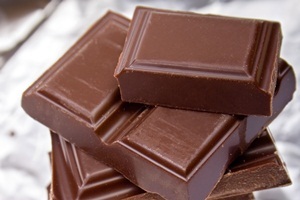 One study showed that test subjects who ate dark chocolate daily saw a significant drop in their blood pressure (5 points systolic and 2 points diastolic), while subjects who ate similar amounts of milk chocolate or white chocolate did not. While this sounds like magic, it really isn't. Chocolate is, after all, derived from plants (cocoa beans), and thus shares one of the nutritional benefits of other dark vegetables – flavonoids. Dark chocolate contains high amounts of catechins (8 times the amount in strawberries), a branch of the flavonoid family that has been proven to be an effective antioxidant. Antioxidants help to fight the effects of aging by reducing the number of free radicals that increase oxidation and thus contribute to the development of many damaging conditions, including heart disease. Catechins also have the benefit of stimulating the production of endorphins (which provide a feeling of pleasure) and serotonin (which acts as a natural anti-depressant). Other studies indicate that dark chocolate can improve blood flow to the brain, thus lessening the possibility of stroke. So the idea that dark chocolate can actually be good for you is true, within reasonable limits. The benefit to health from eating dark chocolate is listed in most of these studies as "moderate," and must be balanced by the knowledge that chocolate is still full of calories. The sugar and fat present in chocolate mean that one 100-gram bar contains over 500 calories. If you're on a limited-calorie diet, eating a whole bar is going to either blow your diet or require you to not eat other foods to balance out your increased caloric intake. Fortunately, large quantities are not required to benefit from flavonoid-rich dark chocolate. In studies where the subjects ate a small-to-moderate amount of dark chocolate, benefits were still seen. For example, in one of the studies that showed significant reductions of blood pressure as a result of adding dark chocolate to their diet, the subjects were limited to 30 chocolate calories a day. That's a portion about the size of one Hershey's Kiss. So although the benefits of eating dark chocolate appear to be real, and are good news both to the health conscious and to us chocophiles, remember that a little goes a long way, and too much will still make you fat. No matter how tempting it may be, don't replace other foods in your balanced diet with dark chocolate; just add small amounts to that diet and remember that moderation is key. Knee pain is one of the most common orthopedic ailments treated by chiropractors. The knee takes a huge amount of stress, as it is built only to bend in one direction; however, many movements we make force the knee to bend slightly in other directions, along with having to support the weight of the body, which can lead to knee pain and injury. It is quite easy to damage the tendons, ligaments, meniscus (knee cartilage) and bones that comprise the knee, and this damage can take months to recover from. Having chronic knee pain can seriously interfere with your life, making it difficult to do the simplest everyday things such as walking up and down stairs, grocery shopping or even just walking across the room. Knee pain can be chronic (i.e. stemming from osteoarthritis, degenerative joint disease, etc.) or acute (i.e. stemming from an accident, sports injury, etc.) Whether due to previous injury, increased body weight or just living longer, degenerative knee pain and is a condition that is becoming much more common in people over age 50, and the chronic pain, swelling and inflammation can put you at higher risk of arthritis. Hyperpronation (putting most of your weight on the outsides of your feet as you walk) can be a cause of knee pain. You may be able to determine if you are hyperpronating by examining the heels of your shoes. If they are excessively worn on the outsides, this is likely due to hyperpronation, and you may want to look into getting special foot supports to correct this problem. While injury to the knee itself is quite common, some people are not aware of the fact that sometimes the pain in their knee may not be due to a knee injury, but is actually referred pain from an irritated nerve in the lower back area of the spinal column. Many with pain in their knees report also having pain in their lower back and pelvis, which may be due to inflammation around the nerves connecting the knee to the spinal cord. While pain medication or cortisone shots may provide temporary pain relief, they do not address the root cause of the problem, and long-term use of either of these medications is not recommended. However, our qualified Tampa chiropractors can evaluate your condition and provide safe, holistic treatment that doesn’t involve the use of drugs or surgery at Sheldon Road Chiropractic & Massage Therapy. MLS Laser Therapy may be recommended to help by using laser light to stimulate faster healing of damaged muscles, joints, tendons and nerves. Our chiropractic treatment in Tampa may involve spinal adjustments, joint manipulation, stretches, exercises, electric muscle stimulation, massage therapy and MLS laser therapy. Please do not hesitate, give our office a call immediately to see how we can help you decrease this discomfort from your life!